Playing the song "pave paradise put in a parking lot" backwards. 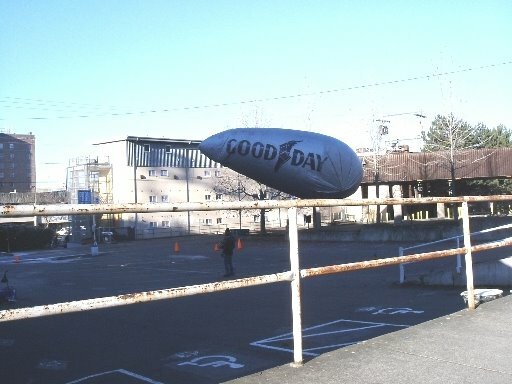 Picture shows balloon in parking lot where tall residential building is planned. 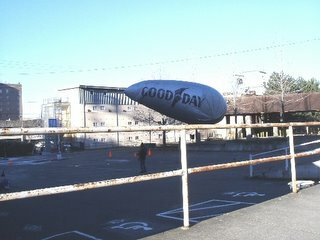 Balloon was bringing a camera up to different levels, for "sneak previews" of what could be seen from various floors. Some people will miss that parking lot. 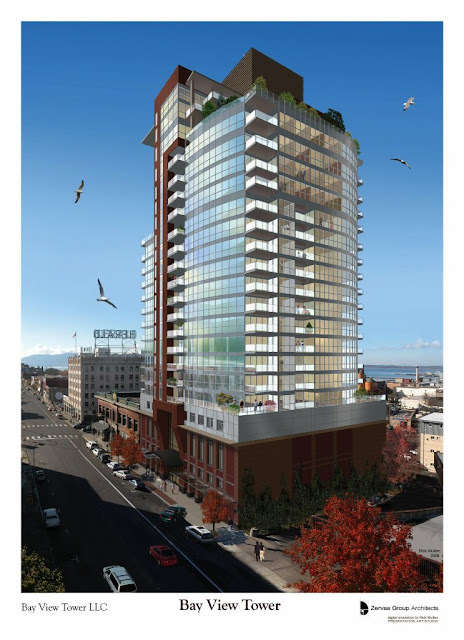 There was recently a meeting about the proposal to build a 23 story condominium building in downtown Bellingham. Bay View Tower it's called. Could be a paradise at least for the people living there and hopefully for folks around it as well. I don't drive or park, so I wouldn't miss the parking lot. Then there is another "Paradise," here in Whatcom County. It's a neighborhood, I hear, is sort of the opposite of true paradise. That area, called Paradise, is located out by Kendall. It's way out away from things like county sheriff services. Has had problems with crime and so forth. Maybe that paradise is too far from what people call "Infra Structure." It's in an unincorporated area away from city services. The building, planned for downtown, Bellingham would be where services are close by. "Building up," instead of "sprawling out," but some folks will miss that parking lot. 40 parking spaces would be removed. The building will provide parking for it's tenants, but some of the businesses, around that neighborhood, are worried. Maybe replacement parking can be built somewhere else; like in a downtown Bellingham parking project. I keep wondering why people are so dependent on cars? Aren't we trying to live in a paradise? Wasn't it "parking" that took out Paradise? The meeting was a mixture of comments about that building. Some favored while others opposed it. Of course, to be fair, not all the opposition to that building was based on lost parking. Some people just think the place will be too tall. It could stick out like a sore thumb, but several other buildings are planned in the area. They would be farther south, along State Street. I like tall buildings even though I would like to see some sort of observation deck, or restaurant open to the public. Something that a tall building can provide to the larger community. Little is planned for public access yet, but plans are never totally cast in stone. One person, at the meeting, complained that the building might be just a, "vertical gated community." Yes, I do think there is too much of that. Gated communities, that is. There is just too much fear and distrust between differing income groups in this society. There is some low income housing planned across the street, also a bit north on State Street. A mix of housing types. That is what downtown is becoming. I like that better than zoning all the rich folks in one neighborhood while the poor live in another, or the poor can't afford to live here at all. I'm still fortunate to have affordable rent in Bellingham. I just take up one small room with a tiny bathroom. Room for my computer and bicycle. Wouldn't it be paradise if people could all live my way? It's easier if one has no pets. Just don't have too much stuff. Building planners are trying to work with the neighborhood. They discussed things like bringing flex-car to Bellingham at that meeting. Also the builders plan to make it a model in "green building" architecture. There would be a rooftop garden that is less of a drainage problem, for the city, than the asphalt parking lot that's there now. Trees and plantings actually absorb, and then slowly parcel out the run off. They do that better than the asphalt of old parking lots. Plants growing on a building. Could that be putting paradise where the parking lot was before? On the other hand, maybe population shouldn't be growing. We are more likely to be able to keep things the way they were if people, the world over, would just cut back on having kids. I remember when people could rent an apartment for $100 per month. They could buy a house for $20,000. Now most houses are well over $300,000. Condos and apartments take up less yard space so they are a bit more reasonable. We're just running out of space, here on planet Earth. North Dakota is still there, but we do need some space for wildlife, agriculture, watersheds and so forth. I do hear that Whatcom County's growth rate has slowed down a bit in the past few years. It's a bit slower than it was in the late 1990s. Slowing down, and more of it is in-filling. I also read that USA population growth rate between 2003 and 2025 is projected to be at around 1.33% each year. Bellingham's growth has been 1.6 % per year between 2000 and 2005. It's a bit higher than the national average, but not like "double the national average." * Growth figures in Dec. 27 05 Herald. Image I found from the net. Proposed Bay View Tower for Bellingham as visioned around 2006. Parking is not the issue. In 5+ years, I've yet to see more than 3 cars in that lot at one time. Usually, I've seen pot-smokers from the 3B. The real issue is how this crazy tall building will pop Bellingham's small-town cherry. The US passed the 200 million mark in 1970. The American century began with a population of 76.5 million in 1900, and ended with 275 million in 2000. So we had a growth spurt between 1970 and 2000 that was the equivalent of almost the entire US popuation in 1900! And some populations grow exponentially (or pyramid-like), one estimate I have read puts the projected population figure at close to 400 million by 2050. I will mostly likely be very old or dead by then, but still that does not bode well for the quality of life in even 2025. Rents may be more stable, but the last time I checked, they still take a sizable chunk out of your pocket if you are working full-time at Walmart or similar places. It's not like when you could work at Pizza Haven part-time and rent your own place. Or shall we say, people no longer have the luxury of opting for a laidback job with the assumption that as long as they settled for a cheap place, they'd be fine: there are no cheap places. Yours is one of the few anomalies in your area. Otherwise, people who are doing laidback work are, sleeping out of their vehicles. The sad thing is that this no-longer-available lifestyle had been the traditional option of choice for writers and others artists, who needed breathing room (free from stress and time constraints) to develop their craft. If the US were not so uptight, they'd provide subsidized housing specifically for professional artists, as they do in Canada (I visited such a place once). Bellingham's small town cherry is popped. The homelessness problem, for example, is one of Bellingham's thoroughly city problems. Accepting Bay View Towers is ending denial.